The first thing to understand about the OpenMM “application layer” is that it is not exactly an application in the traditional sense: there is no program called “OpenMM” that you run. Rather, it is a collection of libraries written in the Python programming language. Those libraries can easily be chained together to create Python programs that run simulations. But don’t worry! You don’t need to know anything about Python programming (or programming at all) to use it. Nearly all molecular simulation applications ask you to write some sort of “script” that specifies the details of the simulation to run. With OpenMM, that script happens to be written in Python. But it is no harder to write than those for most other applications, and this guide will teach you everything you need to know. There is even a graphical interface that can write the script for you based on a simple set of options (see Section 3.5), so you never need to type a single line of code! On the other hand, if you don’t mind doing a little programming, this approach gives you enormous power and flexibility. Your script has complete access to the entire OpenMM application programming interface (API), as well as the full power of the Python language and libraries. You have complete control over every detail of the simulation, from defining the molecular system to analyzing the results. OpenMM is installed using the Conda package manager (http://conda.pydata.org). Conda is included as part of the Anaconda Python distribution, which you can download from http://docs.continuum.io/anaconda/install. This is a Python distribution specifically designed for scientific applications, with many of the most popular mathematical and scientific packages preinstalled. Alternatively you can use Miniconda (available from http://conda.pydata.org/miniconda.html), which includes only Python itself, plus the Conda package manager. That offers a much smaller initial download, with the ability to then install only the packages you want. 1. Begin by installing the most recent 64 bit, Python 3.x version of either Anaconda or Miniconda. 2. (Optional) If you want to run OpenMM on a GPU, install CUDA and/or OpenCL. If you have an Nvidia GPU, download CUDA from https://developer.nvidia.com/cuda-downloads. Be sure to install both the drivers and toolkit. OpenCL is included with the CUDA drivers. If you have an AMD GPU and are using Linux or Windows, download the latest version of the Catalyst driver from http://support.amd.com. On OS X, OpenCL is included with the operating system and is supported on OS X 10.10.3 or later. where cuda92 should be replaced with the particular CUDA version installed on your computer. Supported values are cuda75, cuda80, cuda90, cuda91, cuda92, and cuda100. Because different CUDA releases are not binary compatible with each other, OpenMM can only work with the particular CUDA version it was compiled with. This command confirms that OpenMM is installed, checks whether GPU acceleration is available (via the OpenCL and/or CUDA platforms), and verifies that all platforms produce consistent results. Let’s begin with our first example of an OpenMM script. It loads a PDB file called input.pdb that defines a biomolecular system, parameterizes it using the Amber14 force field and TIP3P-FB water model, energy minimizes it, simulates it for 10,000 steps with a Langevin integrator, and saves a snapshot frame to a PDB file called output.pdb every 1000 time steps. where the typical directory is /usr/local/openmm/examples on Linux and Mac machines and C:\Program Files\OpenMM\examples on Windows machines. You can name your own scripts whatever you want. Let’s go through the script line by line and see how it works. These lines are just telling the Python interpreter about some libraries we will be using. Don’t worry about exactly what they mean. Just include them at the start of your scripts. This line loads the PDB file from disk. (The input.pdb file in the examples directory contains the villin headpiece in explicit solvent.) More precisely, it creates a PDBFile object, passes the file name input.pdb to it as an argument, and assigns the object to a variable called pdb. The PDBFile object contains the information that was read from the file: the molecular topology and atom positions. Your file need not be called input.pdb. Feel free to change this line to specify any file you want, though it must contain all of the atoms needed by the force field. (More information on how to add missing atoms and residues using OpenMM tools can be found in Chapter 4.) Make sure you include the single quotes around the file name. OpenMM also can load files in the newer PDBx/mmCIF format: just change PDBFile to PDBxFile. This line specifies the force field to use for the simulation. Force fields are defined by XML files. OpenMM includes XML files defining lots of standard force fields (see Section 3.6.2). If you find you need to extend the repertoire of force fields available, you can find more information on how to create these XML files in Chapter 6. In this case we load two of those files: amber14-all.xml, which contains the Amber14 force field, and amber14/tip3pfb.xml, which contains the TIP3P-FB water model. The ForceField object is assigned to a variable called forcefield. This line combines the force field with the molecular topology loaded from the PDB file to create a complete mathematical description of the system we want to simulate. (More precisely, we invoke the ForceField object’s createSystem() function. It creates a System object, which we assign to the variable system.) It specifies some additional options about how to do that: use particle mesh Ewald for the long range electrostatic interactions (nonbondedMethod=PME), use a 1 nm cutoff for the direct space interactions (nonbondedCutoff=1*nanometer), and constrain the length of all bonds that involve a hydrogen atom (constraints=HBonds). Note the way we specified the cutoff distance 1 nm using 1*nanometer: This is an example of the powerful units tracking and automatic conversion facility built into the OpenMM Python API that makes specifying unit-bearing quantities convenient and less error-prone. We could have equivalently specified 10*angstrom instead of 1*nanometer and achieved the same result. The units system will be described in more detail later, in Section 11.3.3. This line creates the integrator to use for advancing the equations of motion. It specifies a LangevinIntegrator, which performs Langevin dynamics, and assigns it to a variable called integrator. It also specifies the values of three parameters that are specific to Langevin dynamics: the simulation temperature (300 K), the friction coefficient (1 ps-1), and the step size (0.002 ps). This line combines the molecular topology, system, and integrator to begin a new simulation. It creates a Simulation object and assigns it to a variable called simulation. A Simulation object manages all the processes involved in running a simulation, such as advancing time and writing output. This line specifies the initial atom positions for the simulation: in this case, the positions that were loaded from the PDB file. This line tells OpenMM to perform a local energy minimization. It is usually a good idea to do this at the start of a simulation, since the coordinates in the PDB file might produce very large forces. This line creates a “reporter” to generate output during the simulation, and adds it to the Simulation object’s list of reporters. A PDBReporter writes structures to a PDB file. We specify that the output file should be called output.pdb, and that a structure should be written every 1000 time steps. It can be useful to get regular status reports as a simulation runs so you can monitor its progress. This line adds another reporter to print out some basic information every 1000 time steps: the current step index, the potential energy of the system, and the temperature. We specify stdout (not in quotes) as the output file, which means to write the results to the console. We also could have given a file name (in quotes), just as we did for the PDBReporter, to write the information to a file. Finally, we run the simulation, integrating the equations of motion for 10,000 time steps. Once it is finished, you can load the PDB file into any program you want for analysis and visualization (VMD, PyMol, AmberTools, etc.). OpenMM can build a system in several different ways. One option, as shown above, is to start with a PDB file and then select a force field with which to model it. Alternatively, you can use AmberTools to model your system. In that case, you provide a prmtop file and an inpcrd file. OpenMM loads the files and creates a System from them. This is illustrated in the following script. It can be found in OpenMM’s examples folder with the name simulateAmber.py. In these lines, we load the prmtop file and inpcrd file. More precisely, we create AmberPrmtopFile and AmberInpcrdFile objects and assign them to the variables prmtop and inpcrd, respectively. As before, you can change these lines to specify any files you want. Be sure to include the single quotes around the file names. The AmberPrmtopFile reader provided by OpenMM only supports “new-style” prmtop files introduced in AMBER 7. The AMBER distribution still contains a number of example files that are in the “old-style” prmtop format. These “old-style” files will not run in OpenMM. In the previous section, we loaded the topology from a PDB file and then had the force field create a system based on it. In this case, we don’t need a force field; the prmtop file already contains the force field parameters, so it can create the system directly. For periodic systems, the prmtop file specifies the periodic box vectors, just as a PDB file does. When we call createSystem(), it sets those as the default periodic box vectors, to be used automatically for all simulations. However, the inpcrd may also specify periodic box vectors, and if so we want to use those ones instead. For example, if the system has been equilibrated with a barostat, the box vectors may have changed during equilibration. We therefore check to see if the inpcrd file contained box vectors. If so, we call setPeriodicBoxVectors() to tell it to use those ones, overriding the default ones provided by the System. A third option for creating your system is to use the Gromacs setup tools. They produce a gro file containing the coordinates and a top file containing the topology. OpenMM can load these exactly as it did the AMBER files. This is shown in the following script. It can be found in OpenMM’s examples folder with the name simulateGromacs.py. This script is nearly identical to the previous one, just replacing AmberInpcrdFile and AmberPrmtopFile with GromacsGroFile and GromacsTopFile. Note that when we create the GromacsTopFile, we specify values for two extra options. First, we specify periodicBoxVectors=gro.getPeriodicBoxVectors(). Unlike OpenMM and AMBER, which can store periodic unit cell information with the topology, Gromacs only stores it with the coordinates. To let GromacsTopFile create a Topology object, we therefore need to tell it the periodic box vectors that were loaded from the gro file. You only need to do this if you are simulating a periodic system. For implicit solvent simulations, it usually can be omitted. Second, we specify includeDir=’/usr/local/gromacs/share/gromacs/top’. Unlike AMBER, which stores all the force field parameters directly in a prmtop file, Gromacs just stores references to force field definition files that are installed with the Gromacs application. OpenMM needs to know where to find these files, so the includeDir parameter specifies the directory containing them. If you omit this parameter, OpenMM will assume the default location /usr/local/gromacs/share/gromacs/top, which is often where they are installed on Unix-like operating systems. So in Example 3-3 we actually could have omitted this parameter, but if the Gromacs files were installed in any other location, we would need to include it. Yet another option is to load files created by the CHARMM setup tools, or other compatible tools such as VMD. Those include a psf file containing topology information, and an ordinary PDB file for the atomic coordinates. (Coordinates can also be loaded from CHARMM coordinate or restart files using the CharmmCrdFile and CharmmRstFile classes). In addition, you must provide a set of files containing the force field definition to use. This can involve several different files with varying formats and filename extensions such as par, prm, top, rtf, inp, and str. To do this, load all the definition files into a CharmmParameterSet object, then include that object as the first parameter when you call createSystem() on the CharmmPsfFile. Note that both the CHARMM and XPLOR versions of the psf file format are supported. One way to create your own scripts is to start with one of the examples given above and customize it to suit your needs, but there’s an even easier option. OpenMM-Setup is a graphical application that walks you through the whole process of loading your input files and setting options. It then generates a complete script, and can even run it for you. It will automatically open a window in your web browser displaying the user interface. OpenMM-Setup is far more than just a script generator. It can fix problems in your input files, add missing atoms, build membranes and water boxes, and much more. It is a very easy way to quickly do all necessary preparation and setup. We highly recommend it to all users of OpenMM, from novices to experts. Now let’s consider lots of ways you might want to customize your script. 1. By default, OpenMM will try to select the fastest available Platform. Usually its choice will be reasonable, but sometimes you may want to change it. 2. Alternatively, you can set the OPENMM_DEFAULT_PLATFORM environment variable to the name of the Platform to use. This overrides the default logic. The platform name should be one of OpenCL, CUDA, CPU, or Reference. In some cases, one XML file may load several others. For example, amber14-all.xml is really just a shortcut for loading several different files that together make up the AMBER14 force field. If you need finer grained control over which parameters are loaded, you can instead specify the component files individually. Be aware that some force fields and water models include “extra particles”, such as lone pairs or Drude particles. Examples include the CHARMM polarizable force field and all of the 4 and 5 site water models. To use these force fields, you must first add the extra particles to the Topology. See section 4.4 for details. The force fields described below are the ones that are bundled with OpenMM. Additional force fields are available online at https://github.com/choderalab/openmm-forcefields. The Amber14 force field is made up of various files that define parameters for proteins, DNA, RNA, lipids, water, and ions. The solvent model XML files included under the amber14/ directory include both water and ions compatible with that water model, so if you mistakenly specify tip3p.xml instead of amber14/tip3p.xml, you run the risk of having ForceField throw an exception since tip3p.xml will be missing parameters for ions in your system. The converted parameter sets come from the AmberTools 17 release and were converted using the openmm-forcefields package and ParmEd. The CHARMM36 force field provides parameters for proteins, DNA, RNA, lipids, carbohydrates, water, ions, and various small molecules (see here for full references). Drude polarizable sites and lone pairs are not yet supported by ParmEd and the CHARMM36 forcefields that depend on these features are not included in this port. To use the CHARMM 2013 polarizable force field, include the single file charmm_polar_2013.xml. The solvent model XML files included under the charmm36/ directory include both water and ions compatible with that water model, so if you mistakenly specify tip3p.xml instead of charmm36/water.xml, you run the risk of having ForceField raise an exception due to missing parameters for ions in your system. CHARMM makes extensive use of patches, which are automatically combined with residue templates to create an expanded library of patched residue templates by ForceField. That means that patched residues, such as ACE and NME patched termini, must occur as a single residue in order for ForceField to correctly match the residue template and apply parameters. Since these patched residues are not standard PDB residues, Modeller does not know how to add hydrogens to these nonstandard residues, and your input topologies must already contain appropriate hydrogens. This can often cause problems when trying to read in PDB files from sources such as CHARMM-GUI that do not generate PDB files that comply with the PDB standard. If you’re using files from CHARMM-GUI, it’s easiest to load the PSF file directly, as discussed in Section 3.4. Trying to read in PDB files from sources such as CHARMM-GUI that do not generate PDB files that comply with the PDB standard and omit CONECT records specifying bonds between residues (such as cysteines) or include CONECT records specifying non-chemical H-H bonds in waters can cause issues with the detection and parameter assignment for disulfide bonds. Make sure the files you read in comply with the appropriate standards regarding additional bonds and nonstandard residue definitions. If you’re using files from CHARMM-GUI, it’s easiest to load the PSF file directly, as discussed in Section 3.4. The converted parameter sets come from the CHARMM36 July 2017 update and were converted using the openmm-forcefields package and parmed. The AMOEBA polarizable force field provides parameters for proteins, water, and ions. amoeba2009.xml AMOEBA 2009. This force field is deprecated. It is recommended to use AMOEBA 2013 instead. For explicit solvent simulations, just include the single file amoeba2013.xml. AMOEBA also supports implicit solvent using a Generalized Kirkwood model. To enable it, also include amoeba2013_gk.xml. The older AMOEBA 2009 force field is provided only for backward compatibility, and is not recommended for most simulations. To use the CHARMM 2013 polarizable force field, include the single file charmm_polar_2013.xml. It includes parameters for proteins, water, and ions. When using this force field, remember to add extra particles to the Topology as described in section 4.4. OpenMM includes several older Amber force fields as well. For most simulations Amber14 is preferred over any of these, but they are still useful for reproducing older results. Several of these force fields support implicit solvent. To enable it, also include the corresponding OBC file. Note that the GBSA-OBC parameters in these files are those used in TINKER. They are designed for use with Amber force fields, but they are different from the parameters found in the AMBER application. The following files define popular water models. They can be used with force fields that do not provide their own water models. When using Amber14 or CHARMM36, use the water files included with those force fields instead, since they also include ion parameters. None No implicit solvent is used. OBC1 Onufriev-Bashford-Case GBSA model using the GBOBCI parameters (corresponds to igb=2 in AMBER). OBC2 Onufriev-Bashford-Case GBSA model using the GBOBCII parameters (corresponds to igb=5 in AMBER). This is the same model used by the GBSA-OBC files described in Section 3.6.2. GBn GBn solvation model (corresponds to igb=7 in AMBER). GBn2 GBn2 solvation model (corresponds to igb=8 in AMBER). If they are not specified, the solute and solvent dielectrics default to 1.0 and 78.5, respectively. These values were chosen for consistency with AMBER, and are slightly different from those used elsewhere in OpenMM: when building a system from a force field, the solvent dielectric defaults to 78.3. NoCutoff No cutoff is applied. CutoffNonPeriodic The reaction field method is used to eliminate all interactions beyond a cutoff distance. Not valid for AMOEBA. CutoffPeriodic The reaction field method is used to eliminate all interactions beyond a cutoff distance. Periodic boundary conditions are applied, so each atom interacts only with the nearest periodic copy of every other atom. Not valid for AMOEBA. Ewald Periodic boundary conditions are applied. Ewald summation is used to compute long range Coulomb interactions. (This option is rarely used, since PME is much faster for all but the smallest systems.) Not valid for AMOEBA. PME Periodic boundary conditions are applied. The Particle Mesh Ewald method is used to compute long range Coulomb interactions. LJPME Periodic boundary conditions are applied. The Particle Mesh Ewald method is used to compute long range interactions for both Coulomb and Lennard-Jones. When using any method other than NoCutoff, you should also specify a cutoff distance. Be sure to specify units, as shown in the examples above. For example, nonbondedCutoff=1.5*nanometers or nonbondedCutoff=12*angstroms are legal values. The error tolerance is roughly equal to the fractional error in the forces due to truncating the Ewald summation. If you do not specify it, a default value of 0.0005 is used. For the AMOEBA force field, the valid values for the nonbondedMethod are NoCutoff and PME. The other nonbonded methods, CutoffNonPeriodic, CutoffPeriodic, and Ewald are unavailable for this force field. For implicit solvent runs using AMOEBA, only the nonbondedMethod option NoCutoff is available. In addition, for the AMOEBA force field a cutoff for the Lennard-Jones interaction independent of the value used for the electrostatic interactions may be specified using the keyword vdwCutoff. If vdwCutoff is not specified, then the value of nonbondedCutoff is used for the Lennard-Jones interactions. When using the AMOEBA force field, OpenMM allows the induced dipoles to be calculated in any of three different ways. The slowest but potentially most accurate method is to iterate the calculation until the dipoles converge to a specified tolerance. To select this, specify polarization=’mutual’. Use the mutualInducedTargetEpsilon option to select the tolerance; for most situations, a value of 0.00001 works well. Alternatively you can specify polarization=’extrapolated’. This uses an analytic approximation  to estimate what the fully converged dipoles will be without actually continuing the calculation to convergence. In many cases this can be significantly faster with only a small loss in accuracy. Finally, you can specify polarization=’direct’ to use the direct polarization approximation, in which induced dipoles depend only on the fixed multipoles, not on other induced dipoles. This is even faster, but it produces very different forces from mutual polarization, so it should only be used with force fields that have been specifically parameterized for use with this approximation. The default values are 1.0 for the solute dielectric and 78.3 for the solvent dielectric. None No constraints are applied. This is the default value. HBonds The lengths of all bonds that involve a hydrogen atom are constrained. AllBonds The lengths of all bonds are constrained. HAngles The lengths of all bonds are constrained. In addition, all angles of the form H-X-H or H-O-X (where X is an arbitrary atom) are constrained. The main reason to use constraints is that it allows one to use a larger integration time step. With no constraints, one is typically limited to a time step of about 1 fs for typical biomolecular force fields like AMBER or CHARMM. With HBonds constraints, this can be increased to about 2 fs. With HAngles, it can be further increased to 3.5 or 4 fs. Be aware that flexible water may require you to further reduce the integration step size, typically to about 0.5 fs. The AMOEBA forcefield is intended to be used without constraints. This applies only to hydrogens that are bonded to heavy atoms, and any mass added to the hydrogen is subtracted from the heavy atom. This keeps their total mass constant while slowing down the fast motions of hydrogens. When combined with constraints (typically constraints=AllBonds), this allows a further increase in integration step size. OpenMM offers a choice of several different integration methods. You select which one to use by creating an integrator object of the appropriate type. The three parameter values in this line are the simulation temperature (300 K), the friction coefficient (1 ps-1), and the step size (0.002 ps). You are free to change these to whatever values you want. Be sure to specify units on all values. For example, the step size could be written either as 0.002*picoseconds or 2*femtoseconds. They are exactly equivalent. The only option is the step size. The parameters are the same as for Langevin dynamics: temperature (300 K), friction coefficient (1 ps-1), and step size (0.002 ps). In place of a step size, you specify an integration error tolerance (0.001 in this example). It is best not to think of this value as having any absolute meaning. Just think of it as an adjustable parameter that affects the step size and integration accuracy. Smaller values will produce a smaller average step size. You should try different values to find the largest one that produces a trajectory sufficiently accurate for your purposes. The parameter is the integration error tolerance (0.001), whose meaning is the same as for the Langevin integrator. The MTSIntegrator class implements the rRESPA multiple time step algorithm. This allows some forces in the system to be evaluated more frequently than others. For details on how to use it, consult the API documentation. There are three different integrator types that implement variations of the aMD accelerated sampling algorithm: AMDIntegrator, AMDForceGroupIntegrator, and DualAMDIntegrator. They perform integration on a modified potential energy surface to allow much faster sampling of conformations. For details on how to use them, consult the API documentation. The CompoundIntegrator class is useful for cases where you want to use multiple integration algorithms within a single simulation. It allows you to create multiple integrators, then switch back and forth between them. For details on how to use it, consult the API documentation. If you want to run a simulation at constant temperature, using a Langevin integrator (as shown in the examples above) is usually the best way to do it. OpenMM does provide an alternative, however: you can use a Verlet integrator, then add an Andersen thermostat to your system to provide temperature coupling. To do this, we can add an AndersenThermostat object to the System as shown below. The two parameters of the Andersen thermostat are the temperature (300 K) and collision frequency (1 ps-1). The parameters of the Monte Carlo barostat are the pressure (1 bar) and temperature (300 K). The barostat assumes the simulation is being run at constant temperature, but it does not itself do anything to regulate the temperature. It is therefore critical that you always use it along with a Langevin integrator or Andersen thermostat, and that you specify the same temperature for both the barostat and the integrator or thermostat. Otherwise, you will get incorrect results. Another feature of the anisotropic barostat is that it can be applied to only certain axes of the periodic box, keeping the size of the other axes fixed. This is done by passing three additional parameters that specify whether the barostat should be applied to each axis. The following line specifies that the X and Z axes of the periodic box should not be scaled, so only the Y axis can change size. There is a third barostat designed specifically for simulations of membranes. It assumes the membrane lies in the XY plane, and treats the X and Y axes of the box differently from the Z axis. It also applies a uniform surface tension in the plane of the membrane. The following line adds a membrane barostat that applies a pressure of 1 bar and a surface tension of 200 bar*nm. It specifies that the X and Y axes are treated isotropically while the Z axis is free to change independently. See the API documentation for details about the allowed parameter values and their meanings. If you do not specify this parameter, a default tolerance of 10 kJ/mole is used. The minimizer will exit once the specified number of iterations is reached, even if the energy has not yet converged. If you do not specify this parameter, the minimizer will continue until convergence is reached, no matter how many iterations it takes. OpenMM can save simulation trajectories to disk in three formats: PDB, PDBx/mmCIF, and DCD. All of these are widely supported formats, so you should be able to read them into most analysis and visualization programs. There are three built-in ways to save the results of your simulation in OpenMM (additional methods can be written yourself or imported through other packages like mdtraj or parmed). If you are simply interested in saving the structure, you can write it out as a PDB file using PDBFile.writeFile(). You can see an example of this in the modeller section 4.6. There is a third way to save your simulation, known as a checkpoint file, which will save the entire simulation as a binary file. It will allow you to exactly continue a simulation if the need arises (though whether the simulation is deterministic depends on platform and methods, see 10.4). There are important caveats to this approach, however. This binary can only be used to restart simulations on machines with the same hardware and the same OpenMM version as the one that saved it. Therefore, it should only be used when it’s clear that won’t be an issue. Note that the checkpoint reporter will overwrite the last checkpoint file. Sometimes you have a PDB file that needs some work before you can simulate it. Maybe it doesn’t contain hydrogen atoms (which is common for structures determined by X-ray crystallography), so you need to add them. Or perhaps you want to simulate the system in explicit water, but the PDB file doesn’t contain water molecules. Or maybe it does contain water molecules, but they contain the wrong number of interaction sites for the water model you want to use. OpenMM’s Modeller class can fix problems such as these. Now let’s consider the particular functions you can call. The force field is needed to determine the positions for the hydrogen atoms. If the system already contains some hydrogens but is missing others, that is fine. The Modeller will recognize the existing ones and figure out which ones need to be added. For each residue, it selects the protonation state that is most common at the specified pH. In the case of Cysteine residues, it also checks whether the residue participates in a disulfide bond when selecting the state to use. Histidine has two different protonation states that are equally likely at neutral pH. It therefore selects which one to use based on which will form a better hydrogen bond. If you want more control, it is possible to specify exactly which protonation state to use for particular residues. For details, consult the API documentation for the Modeller class. This constructs a box of water around the solute, ensuring that no water molecule comes closer to any solute atom than the sum of their van der Waals radii. It also determines the charge of the solute, and adds enough positive or negative ions to make the system neutral. This determines the largest size of the solute along any axis (x, y, or z). It then creates a cubic box of width (solute size)+2*(padding). The above line guarantees that no part of the solute comes closer than 1 nm to any edge of the box. Allowed values for the model option are 'tip3p', 'tip3pfb', 'spce', 'tip4pew', 'tip4pfb', and 'tip5p'. Be sure to include the single quotes around the value. This solvates the system with a salt solution whose ionic strength is 0.1 molar. Note that when computing the ionic strength, it does not consider the ions that were added to neutralize the solute. It assumes those are bound to the solute and do not contribute to the bulk ionic strength. Allowed values for positiveIon are 'Cs+', 'K+', 'Li+', 'Na+', and 'Rb+'. Allowed values for negativeIon are 'Cl-', 'Br-', 'F-', and 'I-'. Be sure to include the single quotes around the value. Also be aware some force fields do not include parameters for all of these ion types, so you need to use types that are supported by your chosen force field. The membrane is added in the XY plane, and the existing protein is assumed to already be oriented and positioned correctly. When possible, it is recommended to start with a model from the Orientations of Proteins in Membranes (OPM) database. Otherwise, it is up to you to select the protein position yourself. Because this method also adds solvent, it takes many of the same arguments as addSolvent(). See the API documentation for details. This looks at the force field to determine what extra particles are needed, then modifies each residue to include them. This function can remove extra particles as well as adding them. This is useful, for example, if you want to simulate it with implicit solvent. Be aware, though, that this only removes water molecules, not ions or other small molecules that might be considered “solvent”. Once you have finished editing your model, you can immediately use the resulting Topology object and atom positions as the input to a Simulation. If you plan to simulate it many times, though, it is usually better to save the result to a new PDB file, then use that as the input for the simulations. This avoids the cost of repeating the modelling operations at the start of every simulation, and also ensures that all your simulations are really starting from exactly the same structure. The following example loads a PDB file, adds missing hydrogens, builds a solvent box around it, performs an energy minimization, and saves the result to a new PDB file. In the previous chapter, we looked at some basic scripts for running simulations and saw lots of ways to customize them. If that is all you want to do—run straightforward molecular simulations—you already know everything you need to know. Just use the example scripts and customize them in the ways described in Section 3.6. OpenMM can do far more than that. Your script has the full OpenMM API at its disposal, along with all the power of the Python language and libraries. In this chapter, we will consider some examples that illustrate more advanced techniques. Remember that these are still only examples; it would be impossible to give an exhaustive list of everything OpenMM can do. Hopefully they will give you a sense of what is possible, and inspire you to experiment further on your own. will print detailed documentation on the Simulation class. This code needs very little explanation. The loop is executed 100 times. Each time through, it adjusts the temperature of the LangevinIntegrator and then calls step(1000) to take 1000 time steps. The first thing it does is create a CustomExternalForce object and add it to the System. The argument to CustomExternalForce is a mathematical expression specifying the potential energy of each particle. This can be any function of x, y, and z you want. It also can depend on global or per-particle parameters. A wide variety of restraints, steering forces, shearing forces, etc. can be implemented with this method. Next it must specify which particles to apply the force to. In this case, we want it to affect every particle in the system, so we loop over them and call addParticle() once for each one. The two arguments are the index of the particle to affect, and the list of per-particle parameter values (an empty list in this case). If we had per-particle parameters, such as to make the force stronger for some particles than for others, this is where we would specify them. Notice that we do all of this immediately after creating the System. That is not an arbitrary choice. If you add new forces to a System, you must do so before creating the Simulation. Once you create a Simulation, modifying the System will have no effect on that Simulation. 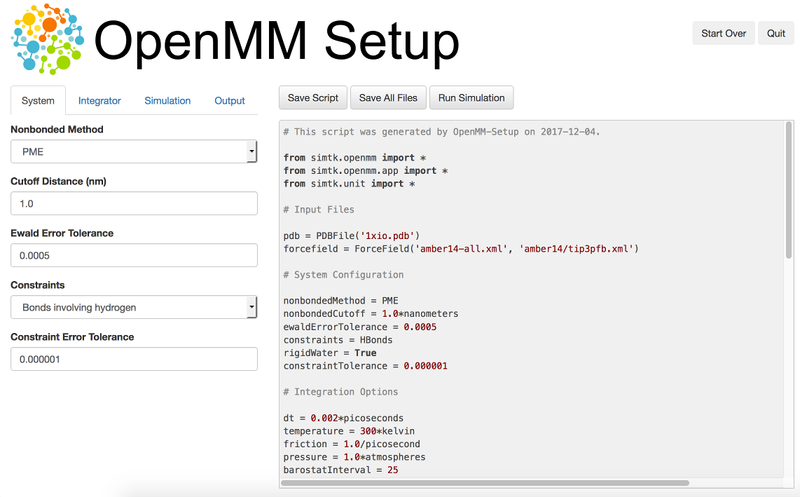 OpenMM provides reporters for three output formats: PDB, PDBx/mmCIF and DCD. All of those formats store only positions, not velocities, forces, or other data. In this section, we create a new reporter that outputs forces. This illustrates two important things: how to write a reporter, and how to query the simulation for forces or other data. The constructor and destructor are straightforward. The arguments to the constructor are the output filename and the interval (in time steps) at which it should generate reports. It opens the output file for writing and records the reporting interval. The destructor closes the file. The number of time steps until the next report. We calculate this as (report interval)-(current step)%(report interval). For example, if we want a report every 100 steps and the simulation is currently on step 530, we will return 100-(530%100) = 70. Whether the next report will need particle positions. Whether the next report will need particle velocities. Whether the next report will need forces. Whether the next report will need energies. Whether the positions should be wrapped to the periodic box. If None, it will automatically decide whether to wrap positions based on whether the System uses periodic boundary conditions. When the time comes for the next scheduled report, the Simulation calls report() to generate the report. The arguments are the Simulation object, and a State that is guaranteed to contain all the information that was requested by describeNextReport(). A State object contains a snapshot of information about the simulation, such as forces or particle positions. We call getForces() to retrieve the forces and convert them to the units we want to output (kJ/mole/nm). Then we loop over each value and write it to the file. To keep the example simple, we just print the values in text format, one line per particle. In a real program, you might choose a different output format. will output forces to a file called “forces.txt” every 100 time steps. We use Python’s listdir() function to list all the files in the directory. We create a PDBFile object for each one and call setPositions() on the Context to specify the particle positions loaded from the PDB file. We then compute the energy by calling getState() with the option getEnergy=True, and print it to the console along with the name of the file. OpenMM uses a simple XML file format to describe force fields. It includes many common force fields, but you can also create your own. A force field can use all the standard OpenMM force classes, as well as the very flexible custom force classes. You can even extend the ForceField class to add support for completely new forces, such as ones defined in plugins. This makes it a powerful tool for force field development. Let’s start by considering how OpenMM defines a force field. There are a small number of basic concepts to understand. Force field parameters are assigned to atoms based on their “atom types”. Atom types should be the most specific identification of an atom that will ever be needed. Two atoms should have the same type only if the force field will always treat them identically in every way. Multiple atom types can be grouped together into “atom classes”. In general, two types should be in the same class if the force field usually (but not necessarily always) treats them identically. For example, the \(\alpha\)-carbon of an alanine residue will probably have a different atom type than the \(\alpha\)-carbon of a leucine residue, but both of them will probably have the same atom class. All force field parameters can be specified either by atom type or atom class. Classes exist as a convenience to make force field definitions more compact. If necessary, you could define everything in terms of atom types, but when many types all share the same parameters, it is convenient to only have to specify them once. Once a force field has defined its atom types and residue templates, it must define its force field parameters. This generally involves one block of XML for each Force object that will be added to the System. The details are different for each Force, but it generally consists of a set of rules for adding interactions based on bonds and atom types or classes. For example, when adding a HarmonicBondForce, the force field will loop over every pair of bonded atoms, check their types and classes, and see if they match any of its rules. If so, it will call addBond() on the HarmonicBondForce. If none of them match, it simply ignores that pair and continues. The order of these tags does not matter. They are described in detail below. There is one <Type> tag for each atom type. It specifies the name of the type, the name of the class it belongs to, the symbol for its element, and its mass in amu. The names are arbitrary strings: they need not be numbers, as in this example. The only requirement is that all types have unique names. The classes are also arbitrary strings, and in general will not be unique. Two types belong to the same class if they list the same value for the class attribute. An <Atom> tag for each atom in the residue. This specifies the name of the atom and its atom type. <VirtualSite type="average3" siteName="M" atomName1="O" atomName2="H1" atomName3="H2"
The remaining attributes are specific to the virtual site class, and specify the parameters for calculating the site position. For a TwoParticleAverageSite, they are weight1 and weight2. For a ThreeParticleAverageSite, they are weight1, weight2, and weight3. For an OutOfPlaneSite, they are weight12, weight13, and weightCross. For a LocalCoordinatesSite, they are p1, p2, and p3 (giving the x, y, and z coordinates of the site position in the local coordinate system), and wo1, wx1, wy1, wo2, wx2, wy2, … (giving the weights for computing the origin, x axis, and y axis). A “patch” is a set of rules for modifying a residue template (or possibly multiple templates at once). For example a terminal amino acid is slightly different from one in the middle of a chain. A force field could of course define multiple templates for each amino acid (standard, N-terminal, C-terminal, and monomer), but since the modifications are the same for nearly all amino acids, it is simpler to include only the “standard” templates, along with a set of patches for modifying terminal residues. An <AddAtom> tag indicates that an atom should be added to the template. It specifies the name of the atom and its atom type. A <ChangeAtom> tag indicates that the type of an atom already present in the template should be altered. It specifies the name of the atom and its new atom type. A <RemoveAtom> tag indicates that an atom should be removed from the template. It specifies the name of the atom to remove. An <AddBond> tag indicates that a bond should be added to the template. It specifies the names of the two bonded atoms. A <RemoveBond> tag indicates that a bond already present in the template should be removed. It specifies the names of the two bonded atoms. An <AddExternalBond> tag indicates that a new external bond should be added to the template. It specifies the name of the bonded atom. A <RemoveExternalBond> tag indicates that an external bond aleady present in the template should be removed. It specifies the name of the bonded atom. These features are experimental, and their API is subject to change. You can use the getUnmatchedResidues() method to get a list of residues in the provided topology object that do not currently have a matching residue template defined in the ForceField. This is useful for identifying issues with prepared systems, debugging issues with residue template definitions, or identifying which additional residues need to be parameterized. # Register the template with the forcefield. Every <Bond> tag defines a rule for creating harmonic bond interactions between atoms. Each tag may identify the atoms either by type (using the attributes type1 and type2) or by class (using the attributes class1 and class2). For every pair of bonded atoms, the force field searches for a rule whose atom types or atom classes match the two atoms. If it finds one, it calls addBond() on the HarmonicBondForce with the specified parameters. Otherwise, it ignores that pair and continues. length is the equilibrium bond length in nm, and k is the spring constant in kJ/mol/nm2. Every <Angle> tag defines a rule for creating harmonic angle interactions between triplets of atoms. Each tag may identify the atoms either by type (using the attributes type1, type2, …) or by class (using the attributes class1, class2, …). The force field identifies every set of three atoms in the system where the first is bonded to the second, and the second to the third. For each one, it searches for a rule whose atom types or atom classes match the three atoms. If it finds one, it calls addAngle() on the HarmonicAngleForce with the specified parameters. Otherwise, it ignores that set and continues. angle is the equilibrium angle in radians, and k is the spring constant in kJ/mol/radian2. <Proper class1="HC" class2="CT" class3="CT" class4="CT" periodicity1="3" phase1="0.0"
<Proper class1="HC" class2="CT" class3="CT" class4="HC" periodicity1="3" phase1="0.0"
<Improper class1="N" class2="C" class3="CT" class4="O" periodicity1="2"
<Improper class1="N" class2="C" class3="CT" class4="H" periodicity1="2"
Every child tag defines a rule for creating periodic torsion interactions between sets of four atoms. Each tag may identify the atoms either by type (using the attributes type1, type2, …) or by class (using the attributes class1, class2, …). The force field recognizes two different types of torsions: proper and improper. A proper torsion involves four atoms that are bonded in sequence: 1 to 2, 2 to 3, and 3 to 4. An improper torsion involves a central atom and three others that are bonded to it: atoms 2, 3, and 4 are all bonded to atom 1. The force field begins by identifying every set of atoms in the system of each of these types. For each one, it searches for a rule whose atom types or atom classes match the four atoms. If it finds one, it calls addTorsion() on the PeriodicTorsionForce with the specified parameters. Otherwise, it ignores that set and continues. periodicity1 is the periodicity of the torsion, phase1 is the phase offset in radians, and k1 is the force constant in kJ/mol. <Proper class1="CT" class2="CT" class3="CT" class4="CT"
<Proper class1="CT" class2="CT" class3="OS" class4="CT" c0="2.439272" c1="4.807416"
<Proper class1="C" class2="N" class3="CT" class4="C" c0="10.46" c1="-3.34720"
<Improper class1="N" class2="C" class3="CT" class4="O" c0="0.8368" c1="0"
<Improper class1="N" class2="C" class3="CT" class4="H" c0="29.288" c1="-8.368"
Every child tag defines a rule for creating Ryckaert-Bellemans torsion interactions between sets of four atoms. Each tag may identify the atoms either by type (using the attributes type1, type2, …) or by class (using the attributes class1, class2, …). The force field recognizes two different types of torsions: proper and improper. A proper torsion involves four atoms that are bonded in sequence: 1 to 2, 2 to 3, and 3 to 4. An improper torsion involves a central atom and three others that are bonded to it: atoms 2, 3, and 4 are all bonded to atom 1. The force field begins by identifying every set of atoms in the system of each of these types. For each one, it searches for a rule whose atom types or atom classes match the four atoms. If it finds one, it calls addTorsion() on the RBTorsionForce with the specified parameters. Otherwise, it ignores that set and continues. The attributes c0 through c5 are the coefficients of the terms in the Ryckaert-Bellemans force expression. <Proper class1="" class2="OS" class3="P" class4="" c0="2.439272" c1="4.807416"
Each <Map> tag defines an energy correction map. Its content is the list of energy values in kJ/mole, listed in the correct order for CMAPTorsionForce’s addMap() method and separated by white space. See the API documentation for details. The size of the map is determined from the number of energy values. Each <Torsion> tag defines a rule for creating CMAP torsion interactions between sets of five atoms. The tag may identify the atoms either by type (using the attributes type1, type2, …) or by class (using the attributes class1, class2, …). The force field identifies every set of five atoms that are bonded in sequence: 1 to 2, 2 to 3, 3 to 4, and 4 to 5. For each one, it searches for a rule whose atom types or atom classes match the five atoms. If it finds one, it calls addTorsion() on the CMAPTorsionForce with the specified parameters. Otherwise, it ignores that set and continues. The first torsion is defined by the sequence of atoms 1-2-3-4, and the second one by atoms 2-3-4-5. map is the index of the map to use, starting from 0, in the order they are listed in the file. The <NonbondedForce> tag has two attributes coulomb14scale and lj14scale that specify the scale factors between pairs of atoms separated by three bonds. After setting the nonbonded parameters for all atoms, the force field calls createExceptionsFromBonds() on the NonbondedForce, passing in these scale factors as arguments. Each <Atom> tag specifies the nonbonded parameters for one atom type (specified with the type attribute) or atom class (specified with the class attribute). It is fine to mix these two methods, having some tags specify a type and others specify a class. However you do it, you must make sure that a unique set of parameters is defined for every atom type. charge is measured in units of the proton charge, sigma is in nm, and epsilon is in kJ/mole. Each <Atom> tag specifies the OBC parameters for one atom type (specified with the type attribute) or atom class (specified with the class attribute). It is fine to mix these two methods, having some tags specify a type and others specify a class. However you do it, you must make sure that a unique set of parameters is defined for every atom type. charge is measured in units of the proton charge, radius is the GBSA radius in nm, and scale is the OBC scaling factor. The energy expression for the CustomBondForce is specified by the energy attribute. This is a mathematical expression that gives the energy of each bond as a function of its length r. It also may depend on an arbitrary list of global or per-bond parameters. Use a <GlobalParameter> tag to define a global parameter, and a <PerBondParameter> tag to define a per-bond parameter. Every <Bond> tag defines a rule for creating custom bond interactions between atoms. Each tag may identify the atoms either by type (using the attributes type1 and type2) or by class (using the attributes class1 and class2). For every pair of bonded atoms, the force field searches for a rule whose atom types or atom classes match the two atoms. If it finds one, it calls addBond() on the CustomBondForce. Otherwise, it ignores that pair and continues. The remaining attributes are the values to use for the per-bond parameters. All per-bond parameters must be specified for every <Bond> tag, and the attribute name must match the name of the parameter. For instance, if there is a per-bond parameter with the name “k”, then every <Bond> tag must include an attribute called k.
The energy expression for the CustomAngleForce is specified by the energy attribute. This is a mathematical expression that gives the energy of each angle as a function of the angle theta. It also may depend on an arbitrary list of global or per-angle parameters. Use a <GlobalParameter> tag to define a global parameter, and a <PerAngleParameter> tag to define a per-angle parameter. Every <Angle> tag defines a rule for creating custom angle interactions between triplets of atoms. Each tag may identify the atoms either by type (using the attributes type1, type2, …) or by class (using the attributes class1, class2, …). The force field identifies every set of three atoms in the system where the first is bonded to the second, and the second to the third. For each one, it searches for a rule whose atom types or atom classes match the three atoms. If it finds one, it calls addAngle() on the CustomAngleForce. Otherwise, it ignores that set and continues. The remaining attributes are the values to use for the per-angle parameters. All per-angle parameters must be specified for every <Angle> tag, and the attribute name must match the name of the parameter. For instance, if there is a per-angle parameter with the name “k”, then every <Angle> tag must include an attribute called k.
<Improper class1="N" class2="C" class3="CT" class4="O" per="2" phase="3.14159265359"
<Improper class1="N" class2="C" class3="CT" class4="H" per="2" phase="3.14159265359"
The energy expression for the CustomTorsionForce is specified by the energy attribute. This is a mathematical expression that gives the energy of each torsion as a function of the angle theta. It also may depend on an arbitrary list of global or per-torsion parameters. Use a <GlobalParameter> tag to define a global parameter, and a <PerTorsionParameter> tag to define a per-torsion parameter. Every child tag defines a rule for creating custom torsion interactions between sets of four atoms. Each tag may identify the atoms either by type (using the attributes type1, type2, …) or by class (using the attributes class1, class2, …). The force field recognizes two different types of torsions: proper and improper. A proper torsion involves four atoms that are bonded in sequence: 1 to 2, 2 to 3, and 3 to 4. An improper torsion involves a central atom and three others that are bonded to it: atoms 2, 3, and 4 are all bonded to atom 1. The force field begins by identifying every set of atoms in the system of each of these types. For each one, it searches for a rule whose atom types or atom classes match the four atoms. If it finds one, it calls addTorsion() on the CustomTorsionForce with the specified parameters. Otherwise, it ignores that set and continues. The remaining attributes are the values to use for the per- torsion parameters. Every <Torsion> tag must include one attribute for every per-torsion parameter, and the attribute name must match the name of the parameter. The energy expression for the CustomNonbondedForce is specified by the energy attribute. This is a mathematical expression that gives the energy of each pairwise interaction as a function of the distance r. It also may depend on an arbitrary list of global or per-particle parameters. Use a <GlobalParameter> tag to define a global parameter, and a <PerParticleParameter> tag to define a per-particle parameter. Exclusions are created automatically based on the bondCutoff attribute. After setting the nonbonded parameters for all atoms, the force field calls createExclusionsFromBonds() on the CustomNonbondedForce, passing in this value as its argument. To avoid creating exclusions, set bondCutoff to 0. Each <Atom> tag specifies the parameters for one atom type (specified with the type attribute) or atom class (specified with the class attribute). It is fine to mix these two methods, having some tags specify a type and others specify a class. However you do it, you must make sure that a unique set of parameters is defined for every atom type. The remaining attributes are the values to use for the per-atom parameters. All per-atom parameters must be specified for every <Atom> tag, and the attribute name must match the name of the parameter. For instance, if there is a per-atom parameter with the name “radius”, then every <Atom> tag must include an attribute called radius. CustomNonbondedForce also allows you to define tabulated functions. See section 6.2.20 for details. The above (rather complicated) example defines a generalized Born model that is equivalent to GBSAOBCForce. The definition consists of a set of computed values (defined by <ComputedValue> tags) and energy terms (defined by <EnergyTerm> tags), each of which is evaluated according to a mathematical expression. See the API documentation for details. The expressions may depend on an arbitrary list of global or per-atom parameters. Use a <GlobalParameter> tag to define a global parameter, and a <PerAtomParameter> tag to define a per-atom parameter. CustomGBForce also allows you to define tabulated functions. See section 6.2.20 for details. The energy expression for the CustomHbondForce is specified by the energy attribute. This is a mathematical expression that gives the energy of each donor-acceptor interaction as a function of various particle coordinates, distances, and angles. See the API documentation for details. particlesPerDonor specifies the number of particles that make up a donor group, and particlesPerAcceptor specifies the number of particles that make up an acceptor group. The expression may depend on an arbitrary list of global, per-donor, or per-acceptor parameters. Use a <GlobalParameter> tag to define a global parameter, a <PerDonorParameter> tag to define a per-donor parameter, and a <PerAcceptorParameter> tag to define a per-acceptor parameter. Exclusions are created automatically based on the bondCutoff attribute. If any atom of a donor is within the specified distance (measured in bonds) of any atom of an acceptor, an exclusion is added to prevent them from interacting with each other. If a donor and an acceptor share any atom in common, that is a bond distance of 0, so they are always excluded. Every <Donor> or <Acceptor> tag defines a rule for creating donor or acceptor groups. The number of atoms specified in each one must match the value of particlesPerDonor or particlesPerAcceptor specified in the parent tag. Each tag may identify the atoms either by type (using the attributes type1, type2, …) or by class (using the attributes class1, class2, …). The force field considers every atom in the system (if the number of atoms is 1), every pair of bonded atoms (if the number of atoms is 2), or every set of three atoms where the first is bonded to the second and the second to the third (if the number of atoms is 3). For each one, it searches for a rule whose atom types or atom classes match the atoms. If it finds one, it calls addDonor() or addAcceptor() on the CustomHbondForce. Otherwise, it ignores that set and continues. The remaining attributes are the values to use for the per-donor and per-acceptor parameters. All parameters must be specified for every tag, and the attribute name must match the name of the parameter. For instance, if there is a per-donor parameter with the name “k”, then every <Donor> tag must include an attribute called k.
CustomHbondForce also allows you to define tabulated functions. See section 6.2.20 for details. The energy expression for the CustomManyParticleForce is specified by the energy attribute. This is a mathematical expression that gives the energy of each interaction as a function of various particle coordinates, distances, and angles. See the API documentation for details. particlesPerSet specifies the number of particles involved in the interaction and permutationMode specifies the permutation mode. The expression may depend on an arbitrary list of global or per-atom parameters. Use a <GlobalParameter> tag to define a global parameter, and a <PerAtomParameter> tag to define a per-atom parameter. Exclusions are created automatically based on the bondCutoff attribute. After setting the nonbonded parameters for all atoms, the force field calls createExclusionsFromBonds() on the CustomManyParticleForce, passing in this value as its argument. To avoid creating exclusions, set bondCutoff to 0. Type filters may be specified with a <TypeFilter> tag. The index attribute specifies the index of the particle to apply the filter to, and types is a comma separated list of allowed types. Each <Atom> tag specifies the parameters for one atom type (specified with the type attribute) or atom class (specified with the class attribute). It is fine to mix these two methods, having some tags specify a type and others specify a class. However you do it, you must make sure that a unique set of parameters is defined for every atom type. In addition, each <Atom> tag must include the filterType attribute, which specifies the atom type for use in type filters. The remaining attributes are the values to use for the per-atom parameters. All per-atom parameters must be specified for every <Atom> tag, and the attribute name must match the name of the parameter. For instance, if there is a per-atom parameter with the name “radius”, then every <Atom> tag must include an attribute called radius. CustomManyParticleForce also allows you to define tabulated functions. See section 6.2.20 for details. The custom forces described in this chapter involve user defined algebraic expressions. These expressions are specified as character strings, and may involve a variety of standard operators and mathematical functions. The following operators are supported: + (add), - (subtract), * (multiply), / (divide), and ^ (power). Parentheses “(“and “)” may be used for grouping. The following standard functions are supported: sqrt, exp, log, sin, cos, sec, csc, tan, cot, asin, acos, atan, sinh, cosh, tanh, erf, erfc, min, max, abs, floor, ceil, step, delta, select. step(x) = 0 if x < 0, 1 otherwise. delta(x) = 1 if x is 0, 0 otherwise. select(x,y,z) = z if x = 0, y otherwise. Some custom forces allow additional functions to be defined from tabulated values. Numbers may be given in either decimal or exponential form. All of the following are valid numbers: 5, -3.1, 1e6, and 3.12e-2. The definition of an intermediate value may itself involve other intermediate values. All uses of a value must appear before that value’s definition. The “min” and “max” attributes define the range of the independent variables for a continuous function. The “size” attributes define the size of the table along each axis. The tabulated values are listed inside the body of the tag, with successive values separated by white space. See the API documentation for more details. In forces that use an <Atom> tag to define parameters for atom types or classes, there is an alternate mechanism you can also use: defining those parameter values in the residue template. This is useful for situations that come up in certain force fields. For example, NonbondedForce and GBSAOBCForce each have a charge attribute. If you only have to define the charge of each atom type once, that is more convenient and avoids potential bugs. Also, many force fields have a different charge for each atom type, but Lennard-Jones parameters that are the same for all types in a class. It would be preferable not to have to repeat those parameter values many times over. Notice that the charge attribute is missing, and that the parameters are specified by class, not by type. This means that sigma and epsilon only need to be specified once for each class. The atom charges, which are different for each type, are taken from the residue template instead. The file attribute gives the path of the file to include. It may be relative either to the directory containing the parent XML file (the one with the <Include> tag) or the OpenMM data directory (the one containing built in force fields). If multiple XML files are specified when a ForceField is created, their definitions are combined as follows. A file may refer to atom types and classes that it defines, as well as those defined in previous files. It may not refer to ones defined in later files. This means that the order in which files are listed when calling the ForceField constructor is potentially significant. Forces that involve per-atom parameters (such as NonbondedForce or GBSAOBCForce) require parameter values to be defined for every atom type. It does not matter which file those types are defined in. For example, files that define explicit water models generally define a small number of atom types, as well as nonbonded parameters for those types. In contrast, files that define implicit solvent models do not define any new atom types, but provide parameters for all the atom types that were defined in the main force field file. For other forces, the files are effectively independent. For example, if two files each include a <HarmonicBondForce> tag, bonds will be created based on the rules in the first file, and then more bonds will be created based on the rules in the second file. This means you could potentially end up with multiple bonds between a single pair of atoms. The ForceField class is designed to be modular and extensible. This means you can add support for entirely new force types, such as ones implemented with plugins. For every force class, there is a “generator” class that parses the corresponding XML tag, then creates Force objects and adds them to the System. ForceField maintains a map of tag names to generator classes. When a ForceField is created, it scans through the XML files, looks up the generator class for each tag, and asks that class to create a generator object based on it. Then, when you call createSystem(), it loops over each of its generators and asks each one to create its Force object. Adding a new Force type therefore is simply a matter of creating a new generator class and adding it to ForceField’s map. It then should parse the information contained in the XML tag and configure the generator based on it. When createSystem() is called on the ForceField, it first creates the System object, then loops over each of its generators and calls createForce() on each one. This method should create the Force object and add it to the System. data is a ForceField._SystemData object containing information about the System being created (atom types, bonds, angles, etc. ), system is the System object, and the remaining arguments are values that were passed to createSystem(). To get a better idea of how this works, look at the existing generator classes in forcefield.py. If this method exists, it will be called after all Forces have been created. This gives generators a chance to make additional changes to the System. The key is the XML tag name, and the value is the static method to use for parsing it. Now you can simply create a ForceField object as usual. If an XML file contains a <MyForce> tag, it will be recognized and processed correctly. This feature is experimental, and its API is subject to change. Typically, when ForceField encounters a residue it does not have a template for, it simply raises an Exception, since it does not know how to assign atom types for the unknown residue. However, ForceField has an API for registering residue template generators that are called when a residue without an existing template is encountered. These generators may create new residue templates that match existing atom types and parameters, or can even create new atom types and new parameters that are added to ForceField. This functionality can be useful for adding residue template generators that are able to parameterize small molecules that are not represented in a protein or nucleic acid forcefield, for example, or for creating new residue templates for post-translationally modified residues, covalently-bound ligands, or unnatural amino acids or bases. The ForceField object to which residue templates and/or parameters are to be added. The residue topology for which a template is to be generated. If the generator is able to successfully parameterize the residue, `True` is returned. to load residue definitions from an ffxml file. The ForceField object will be modified by the residue template generator as residues without previously defined templates are encountered. Because these templates are added to the ForceField as new residue types are encountered, subsequent residues will be parameterized using the same residue templates without calling the generator again.